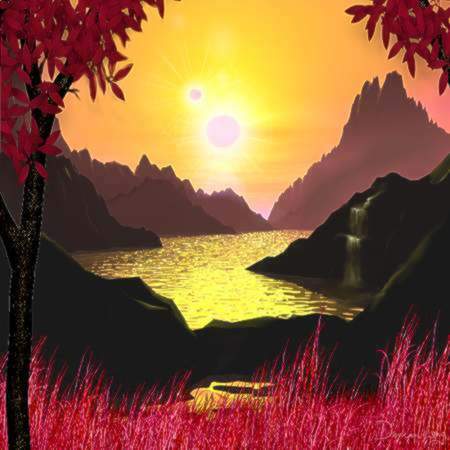 The lands of Exodus, the world of red suns, moons of blue, snow and ice with little chill, and grasses that grow in tall lengths of flaming red. There is extreme temperatures rendered in this world making it fruitful in many different ways. The Volkatis walked in the light and dark with their Gods a complete semblance of balance. Lenser the King of all Gods, doesn't represent any one deity, and over looks Gods, races and creatures. Read on about the Gods of Exodus! At the peak of the Exodus population the numbers began to grow, quickly dragons began to overcrowd the lands and overbalance nature. There was a higher race the Lensians and they began to send a number of their population to regions not yet explored hoping to venture areas to move the dragons to. The Lensians were drawn to the Froman Mountains where the climate could provide habitation to most species of these dragons. The Froman Mountains being of an odd stone was never taken in consideration coinciding with the fire-breathing dragons. Soon the remote areas became over run with dragons especially the foliage eaters and then disaster struck,to the delight, of Shanten Goddess of Fire and Rage. The lands became chaotic in elements, the fire from the dragons making the Argant iron in the mountain regions begin to melt down. The Volkatis prayed to their Gods who protected them, as Lensen King of Gods looked over the entire aspect of the world. Shanten devious in nature and temper pretended to be in good standing with Lensen. In her darkness she secreted a plan to overcome the Goddess "Aquarao" Goddess of Water. While Shanten began her secret channeling, the true God of Light "Chandel" and Darkness "Gamori" were intensely watching their people of Exodus. While the Volkatis were being healed and harbored the dragons soon began depleting nature, and room to live. Shanten taking this opportunity hoped to take the dragon's fire as her own. She watched the progression of the fire dragons growth and channeled as much of the fire she could to overthrow Aquarao, only when she began to release it the fires were stronger than even she could realize, and then the chaos of fire began. All the Gods became enraged and there became a clash of all Gods. The lands began to burn worse than any volcanic eruption, and killed most Volkatis in the lands of Exodus. Even Gamori the dark God set against Shanten as did Lensen punishing her temporally by taking her fire from her and reminding her of her foolish act, making the suns and grasses red in the land of Exodus. Click here now to read about each individual god.